← Candy and soda for breakfast, again! Are your pants making you fat? 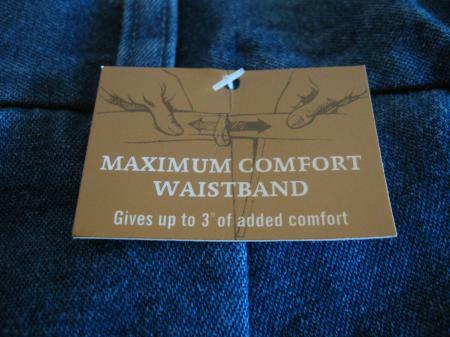 If you have purchased new pants recently you may have noticed that they have an adjustable or expandable waist. Some men’s pants include up to two extra inches to allow you to “flex” or “move more freely.” Women’s pants might have elastic hidden in the waist band for extra “stretch.” While these pants are designed to be comfortable, they could be making you fat! Most people gain weight as they age, typically a slow process that may not be immediately noticeable. If you have pants with a two-inch expandable waist you could easily gain weight while still wearing the same pants size. In fact, you could gain two inches of fat around your waist before you noticed. For many people, tight-fitting pants are a signal that they may have gained a few pounds. If you miss that cue you could easily gain significant weight, which requires a significant effort to fix. This might sound like a minor issue, but external cues like this are important to help us recognize weight gain. In a classic example, a man puts on his favorite suit for the first time in over a year to find that the pants are too tight. Immediately he realizes that he has gained weight since he last wore the suit. Imagine, though, if his suit pants stretched to accommodate his larger waist. He might still think that, since the pants still fit, he hasn’t gained any weight. This is important since people typically gain weight little by little over time, which may not be appreciated without these external cues. One way to prevent surprise weight gain is to weigh yourself regularly so that you can make adjustments to your diet and activity to prevent further weight gain. In fact, one common characteristic of the “successful losers” in the National Weight Control Registry is that they weigh themselves at least once a week. This is important because it’s easier to make adjustments to lose weight that’s gained in a week versus weight that is gained over a month or more. This is also why people who lose weight should get rid of their “fat clothes.” Typically, these clothes get pushed to the back of the closet. But they are still readily available, so when the person regains some of the weight, it is easy to reach for a larger size. If those clothes had been packed away in a box in the attic, retrieving and unpacking them would be a noticeable sign that they had gained weight and may motivate them to get back on track. Even small changes to our diet and activity patterns can lead to weight gain over time. Since this weight gain can often go unnoticed, it is important that we pay attention to external cues. The way our clothes fit is one such reminder, but there are others. Do you notice that you feel more out of breath doing routine activities, like climbing a flight of stairs? Is it more difficult to bend over and tie your shoes? These are both signs that your fitness may be declining and that it is time to start exercising. These cues are easy to ignore, but they are important signs that it is time to make changes to your diet and activity habits. It is even easier to prevent weight gain or to stay fit than it is to lose weight or get in shape. So, don’t let your pants trick you! Pay attention to how your clothes fit and how you feel and use these cues to guide you to maintain good health. This entry was posted in Health & Fitness and tagged clothing size, fat pants, obesity, successful losers, weight gain, weight loss. Bookmark the permalink.